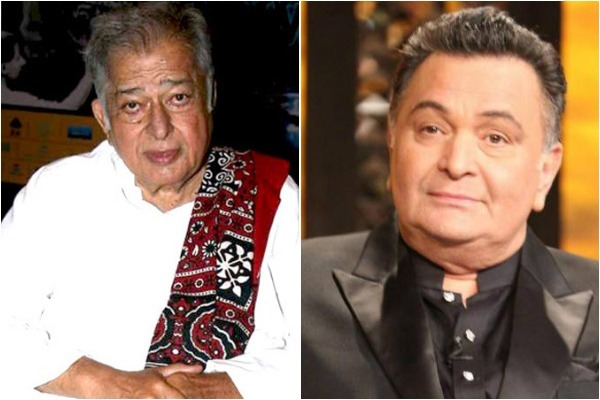 Rishi took to his Twitter handle to share throwback pictures of the late actor-filmmaker. 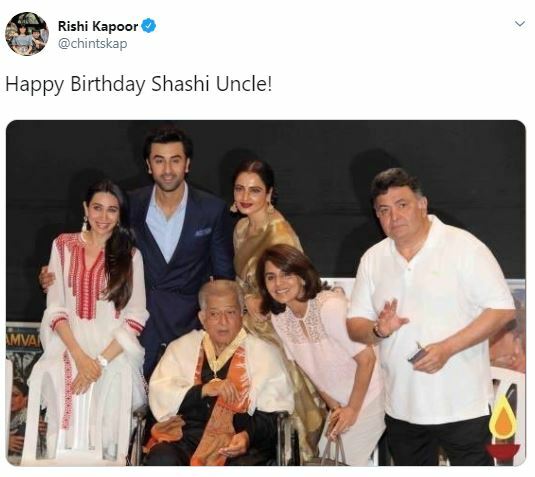 “Happy Birthday Shashi Uncle,” he wrote along with a photo in which he can be seen posing with Shashi, Neetu Kapoor, Rekha, Karisma Kapoor and Ranbir Kapoor. He also posted another throwback photo of the 'Deewar' actor when he was conferred with Dadasaheb Phalke award in 2015. The photo features Shashi with his children—Kunal Kapoor and Sanjana Kapoor. 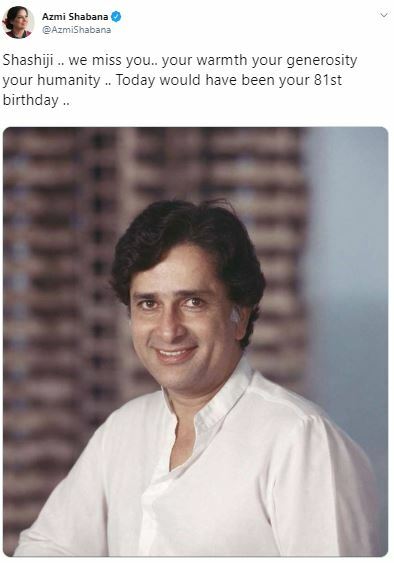 “What a proud moment for the Shashi Kapoor family! 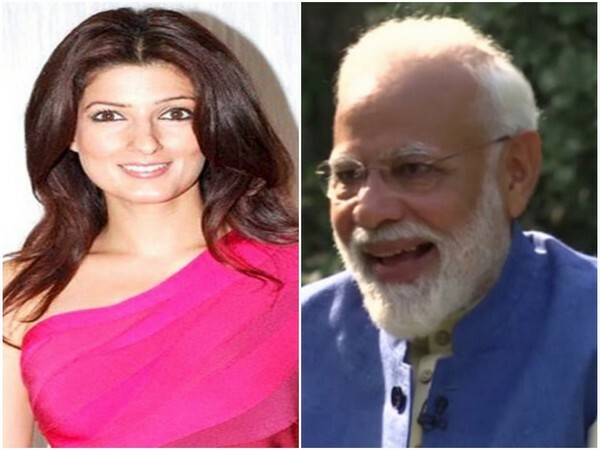 Dada Sahab Phalke award for him. Third Phalke Award in the family! Happy Birthday uncle,” Rishi wrote in another tweet. 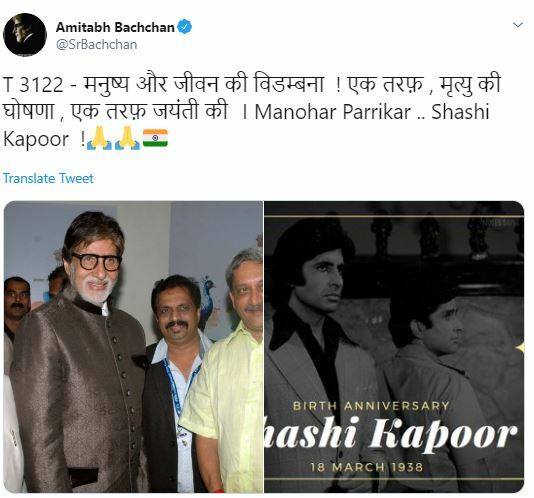 Amitabh Bachchan, who has previously worked with Shashi in numerous films including ‘Amar Akbar Anthony’, ‘Deewar, ‘Namak Halal’, ‘Suhaag’, among many others, also remembered him while also mourning the loss of Goa chief minister Manohar Parrikar. Shashi was known for his grace, style and impeccable chivalry. The late star of Bollywood also belonged to the first family of Indian cinema, The Kapoor family. Son of Prithviraj Kapoor and younger brother of Raj Kapoor and Shammi Kapoor, Shashi Kapoor made his debut in Bollywood with the 1961 film 'Dharmputra' after working as a child artist. The iconic star acted in more than 150 films, including a dozen English language films. He was known for playing romantic roles and charmed the audience with his good looks and brilliant acting skills. His films like ‘Deewar’, ‘Satyam Shivam Sundaram’, ‘Trishul’, ‘Suhaag’ and many more were appreciated by the audience and critics alike. Bollywood's ultimate 'charm house' Shashi Kapoor then went on to make a name for himself globally by associating with international cinema. He was honoured with the Padma Bhushan -- the third highest civilian honour -- by the Indian government in 2011. For his contribution to Indian cinema, the artiste was honoured thrice with National Awards. As a producer, he worked on films like ‘Junoon’, ‘Vijeta’ and ‘36 Chowringhee Lane’. He also made his directorial debut in 1991 with ‘Ajooba’.